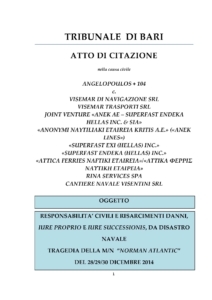 The claims of the Surviving passengers and of the Relatives of the Deceased passengers from the tragedy of the NORMAN ATLANTIC who are represented by our law firm, have been filed before the Tribunale di Bari, in Italy, to preserve the two years’ limitation period imposed by the Regulation (EC) 392/2009, despite the fact that the Technical Report on the circumstances and causes of the maritime tragedy has not yet been issued by the court experts in Bari. The claimants require the restitution of all their pecuniary and non pecuniary damages, including moral and bereavement damages. 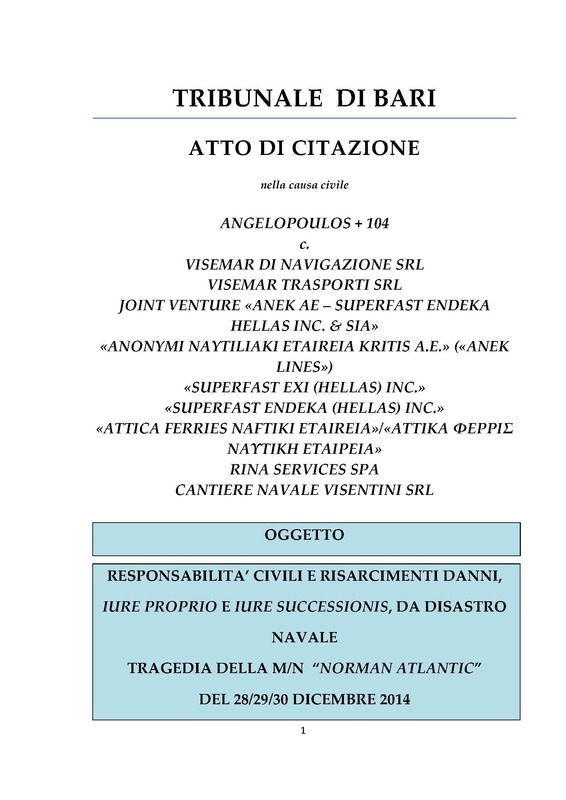 The claims are filed against the sea carriers Joint Venture «ΑΝΕΚ ΑΕ – SUPERFAST ENDEKA HELLAS INC. & ΣΙA», ANEK LINES and VISEMAR DI NAVIGAZIONE SRL, but also against the registered owner of the ship VISEMAR DI TRASPORTI SRL, the classification society of the ship and recognized organization acting for the Italian Flag State Authority «RINA SERVICES SPA», and against the shipyard «CANTIERE NAVALE VISENTINI SRL», where the ro-ro NORMAN ATLANTIC has been built.